Samveda Yoga | Inspiration. Movement. Transformation. The root chakra, also known as Muladhara is the first chakra of the chakra anatomy. It is located at the base of the spine. The color is red with a square shape and four petals of the lotus flower. The properties of the base chakra are very instinctual, emphasizing basic needs, survival, grounding, foundation, and security. Another way to understand is Maslow’s Hierarchy of needs. The first tier of the pyramid is physiological needs to help us function just like Muladhara. Muladhara builds a cornerstone with our environment, earth, and body. It is important to feel secure and safe in who we are to make it easier to survive. Sometimes situations can occur where our needs are compromised, or our foundation of who we are is faulty. When we lack these basic needs and foundations, we may experience imbalances. Feelings of insecurities, cynicism, negative energy and living in constant survival mode will reflect a deficiency in the base chakra. Physical defects may manifest as eating disorders, colon and bladder problems, and prostate complications in men. Affirmations help with reassuring your confidence. It is shifting negative energy or thoughts into positivity. A tip for balancing the root chakra is to focus on the tip of your nose to emulate qualities. The nose is the sense organ for Muladhara which makes sense of smell very heightened. There are poses in a yoga practice that can activate Muladhara energy. The first position is Sukhasana where you are sitting in a cross-legged position with your eyes closed. Staying in allows you to meditate and ground yourself on the mat. It is great for setting your intention and shifting your focus to the objective of the day. It helps with personal balance and trusting your thoughts. 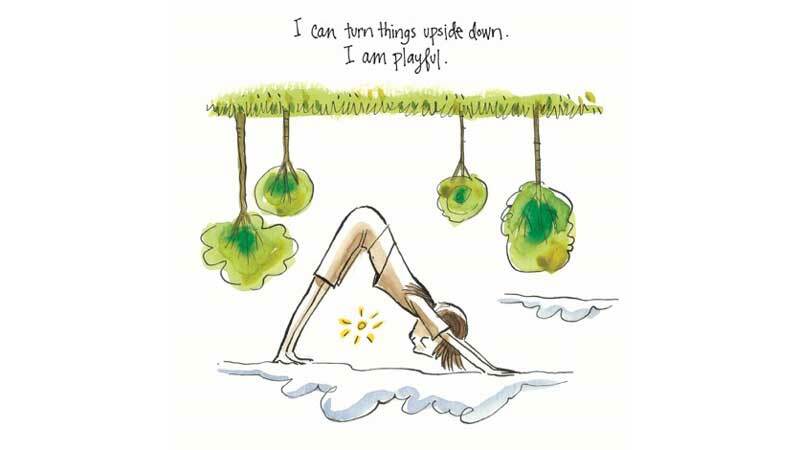 The second pose is Balasana which is also known as the child’s pose. It is often a resting pose. Take the time to let your body surrender and commit to the practice. Mountain pose is a perfect pose for grounding and building your foundation. Remember to inhale and exhale deeply in this pose. Doing this outside may establish a deeper connection with the environment and the world around you. Feeling secure with your emotions and needs develops strength in Muladhara energy over time. Practicing affirmations and poses will open the chakra or eliminate the negative energy that is blocking the base chakra. Ganda Bherundasana or Formidable Face Pose is an advanced Yoga backbend that strengthens the upper back, arms and shoulders. It also opens the chest, stretches the whole front of the body and tones the abdominal muscles. This posture can be detrimental to the neck especially when performed without proper guidance. Placing your weight on your arms and chest while avoiding any strain on your neck, bending your back and reaching your feet up to your head, is not an easy movement. Formidable Face Pose lengthens the spine, but when done without mastering the foundations of Yoga and a proper approach, this pose can be harmful to the body. Before you approach the full Formidable Face Pose, preparing the body for the intense movements is very important. Do not hop into any Yoga pose without warming up your body. Flow smoothly to heat your core and activate all muscles you’ll need for a specific pose. Yoga Push-Up/Chaturanga Dandasana: This version of push-up effectively strengthens the arms and core, which is necessary for supporting your weight. How To Do The Pose: Start in a plank pose. Make sure that your hands are parallel to your shoulders and spread your fingers in order to have a wider balancing area. Push away from the floor to activate your back muscles. Engage your core by sucking your belly in, tightening your gluteus and legs against each other. To lower yourself on the floor, take a breath in, then exhale. As you exhale, bend your elbows, keeping them close to your ribcage. Maintain a straight line on your body, keeping it parallel to the ground. Hold the pose for five breaths. 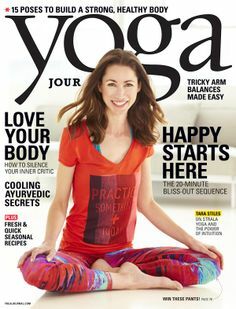 Cobra Pose/Bhujangasana. This pose is a gentle chest opener and backbend. Cobra Pose effectively warms up the spine and stretches the muscles at the front of your legs. Though you must avoid any mistakes while taking it casually. How To Do The Pose: Lie on your stomach with your feet together. Place your hands beneath your shoulders and your elbows beside your ribcage. Take a breath in as you slowly push away from the floor, extending your spine up and back, pressing your pubic bone down. Keep pressing until your arms are fully extended. Make sure that your shoulders are drawn away from the ear. Hold the pose for five breaths. Lunge/Warrior I: Performing Warrior I gently opens the hips, back and chest. It also stretches the quads, strengthens the legs and lengthens the spine. How To Do The Pose: Start in a plank position. Inhale and extend your right leg up in the sky, then exhale, bring it between your hands. Turn your back leg 45 degrees outwards and slowly stand, keeping your right knee on a 90-degree angle. Push your hips forward to maintain your weight on your right foot. Bring your hands in prayer, and then extend your arms up as you inhale. Hold the pose for five breaths and do the same process on the other leg. Formidable Face Pose/ Ganda Bherundasana: If you’re trying the pose for the first time, it is recommended to practice under the guidance of an experienced Yoga teacher. Be patient and always listen to your body. How to do the pose: Begin on all fours, knees and elbows planted on the ground. Spread your fingers, and then bring your shoulders above to your wrists. Keep in mind to keep your elbows close to your ribs. After that, extend your left leg back on the floor, and then lift your right foot up to the sky. Point your right foot’s toes. Soften your spine while keeping your arms activated. Inhale, and then press the ball of your left foot away from the ground to fully lift your right leg, followed by the left. Don’t collapse your shoulders and always make sure that your core and gluteus are activated to avoid putting any strain on your chin or neck. Slowly reach your toes down to your forehead. Stay in this position for five breaths. To release, lower your legs back down with control. Rest on Child’s Pose. You may not be able to do the full pose though you have mastered the basic foundations. Learning requires patience and an open mind. Regularly practice with good intentions, and you’ll surely be curving smoothly soon. As you advance to your practice, you may find some of your favorite Yoga pants are fading, starting to wear off or becoming loose. Having durable and comfortable workout clothes is very important especially if you move intensely. Advanced poses such as Formidable Face Pose can cause damage to your leggings if they aren’t well crafted or overused. Have a look at this amazing legging for women you’ll surely love! Splendid French Terry Legging: These Yoga pants are ultra-soft and very cozy. Made of 4% spandex, 48% modal and 48% pima cotton, these mid-rise waisted leggings fit perfectly to the body and emphasize the curves. Unlike most leggings for women out in the market today, Splendid French Terry Leggings are not see-through. Sometimes, even the thought of learning this pose is already intimidating. Great things often times have scary beginnings. You may not be able to control the process of progress, but you can control your thoughts. Always be patient with your journey and approach the challenges with composure. Practice safely and most importantly, have fun! Traveling is amazing and there’s nothing quite like it. When you travel a lot, even with all the problems and annoyances, the world opens in way that you can’t easily describe to people who don’t travel very much. Unfortunately, traveling a lot has its downsides too and one of the big ones is the fact that your exercise routine tends to get forgotten. Between a new environment, working out how and where to get food, where to stay, and looking at all of the new and amazing things, the idea of working out just seems like too much trouble. If you’re staying somewhere for a long time or spending a few months on the move in different countries, you really do need to exercise. Otherwise, you can’t eat all that amazing food without ending up not being able to fit into your clothes, and nobody wants to come home and have to diet. One of the problems with exercising when you’re traveling is the time factor. This especially applies when you’re constantly on the move, taking trains, buses, and planes to different areas or countries. The idea of spending an hour in your room when you could be taking in some amazing tourist sights seems like a waste of time. But it isn’t. The reason people do yoga is to relax. Of course, there is the fitness element, but for the most part, yoga is about moving your muscles in a way that makes them stronger and looser. Yoga is also about settling your mind into that peculiar open, calm state that yoga seems to invoke so easily. That doesn’t mean that you need to spend an hour in your hotel room every day. It means that you need to carve out twenty minutes to half an hour and have a routine already in place for when you travel. It’s especially helpful after flights and long bus rides, when your muscles are tensed and cramped, and your mind is stressed after dealing with all the logistical aspects of travel. Sometimes, a short yoga session can be just what you need to unwind and start to enjoy the new place you landed in. Another concern for traveling can be space. Most hotel rooms are tiny, without the room to really move around, and your travel yoga routine must respect and compensate for that. You also need to restrict your practice to moves that work well without a yoga mat, unless you’re happy to carry one stashed in your suitcase. With all that in mind, here are a few yoga moves that can be adapted for wherever you end up. Chair pose: This pose is a great warm up. Start with your feet hip distance apart and your arms out to the sides, lower yourself until your thighs are parallel to the ground. Warrior II: Stand at one end of the space you have, step back and turn your back foot at a forty-five-degree angle. Face forward, with your arms out to the sides and lunge over your front leg. Triangle: With your legs in the same position and your arms out, hinge forward over your front leg without moving your hips until you can’t bend any further, lower your bottom hand to the ground and stretch the top one up to the sky. Split leg Bend: With your legs apart and your feet parallel, bend forward and try to put your head on the ground. With a little bit of thought, and perhaps some rearranging of furniture in your hotel room, you can create your own yoga routine that is quick and easy but still effective and allows you to maintain all the conditioning you’ve gained at home. That’s one of the amazing parts of yoga, it’s instantly adaptable to its surroundings and easy to keep as part of your life even when everything else is changing. Aerial yoga is the same as traditional yoga, but with a nifty addition. Instead of practicing on a mat, you practice swinging through the air. 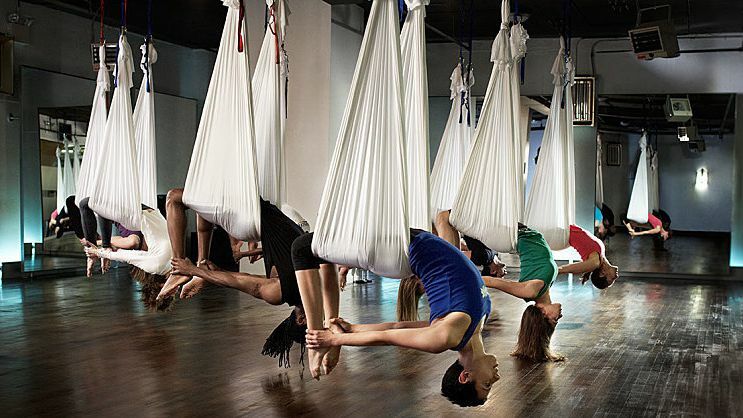 During an aerial yoga class, you sit in a fabric hammock. Aerial yoga hammocks are different from traditional hammocks used for outdoor activities. These hammocks resemble long scarves. The long scarf is suspended so that there is a drooping middle that resembles a swing and two strands of the fabric on either side to hold on to. Yoga hammocks are designed in this way to allow maximum amount of movement. This hammock hangs from the ceiling and is made out of high-density nylon material to prevent tearing. The hammocks are held up by carabiners, support chains, and webbing straps. Each hammock can be adjusted to the perfect height for the practitioner. Hammocks come in various styles and colors. Not only is this class fun and inventive, but the colored hammocks swinging and swaying makes for a beautiful environment. Traditional yoga poses are taken during class with aerial adaptions. It’s a combination of acrobatic arts and anti-gravity asana (poses). Simple stretches may be taken while seated in the hammock. However, other poses can be taken completely off the ground hanging upside down. Full relaxation on the back or Savasana can be taken to a whole new level during Aerial yoga. The practitioner can relax fully back into the hammock and float above the ground to achieve pure relaxation. Aerial yoga also makes it easier to practice more challenging mat poses such as handstands and forearm stands. Instead of using the wall to try and master these poses, the hammock helps to support and hold these poses in a more natural way. Being suspended has more of a realistic feel as opposed to leaning against a wall to balance. Being suspended off the ground is not only fun, but it also packs some big benefits. The fabric hammock provides more freedom of movement. The hammock allows for deeper stretches. The flexible support system allows for lunges, back bends, and other stretches to be taken beyond what could be achieved on a simple mat. By using the fabric hammock in aerial yoga, simple mat stretches will prove to be easier and flexibility will improve greatly. Being suspended in the air allows you to focus on your surroundings more. This provides for a more alert and focused practice. Yoga is not only about physical movements, but mental awareness as well. Being suspended in the air forces the mind to concentrate more on the movements that it is doing. Connecting the mind and body this way is the core and ultimate accomplishment of any yoga practice. Aerial yoga is also an awesome ab workout. Swinging through the air might seem like a fun and easy workout, but after that first class your abs will be burning. This is because during practice you have to keep yourself stable which immediately engages the core muscles. This means your core is engaged during the entire practice instead of just during specific poses. Aerial yoga is perfect for those that have joint and spine problems. The hammock provides a zero impact practice that puts no pressure on aching knees and joints. Hanging from the hammock also decompresses the spine which in turn provides some much needed pain relief. This new take on traditional yoga is gaining momentum and with good reason. Aerial yoga not only provides the wonderful benefits of traditional yoga but also has the addition of benefits from being suspended in the air. 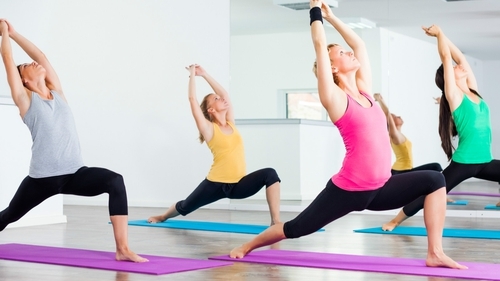 It further broadens the amount of people that can practice and enjoy the benefits of yoga. If you would like comfortable workout leggings for aerial yoga then make sure to check out this site. Thanks for reading! I don’t know about you but if I get little to no sleep at night, my whole day is shot. Getting a good night’s sleep not only makes you feel rested but also helps your body recover from the day. It also helps reduce stress. Many people struggle to get enough sleep though, so what can we do to solve that? If you are desperate for a night of solid sleep, having a nightly yoga routine could help you catch some more zzz’s. Grab your favorite pair of black leggings or pajamas and get ready for bed; here are several poses that will help you settle your mind and relax. Child’s Pose: Child’s Pose is a classic resting yoga pose. To perform, start in a table top position then spread your knees wide while keeping your toes together. Bow your torso forward between your legs and let your forehead touch the ground. Rest your arms alongside your legs or extended forward. Child’s Pose helps to calm the brain which is what you want when trying to sleep! Wide-Legged Forward Bend C: Wide-Legged Forward Bend C has a variety of calming effects, which make it a great pose to do before bedtime. This pose has benefits of both inversion poses and forward folds. It calms the mind and gives relief from stress, anxiety, and mild depression. Perform this pose by standing with your feet 3-4 feet apart on your mat, your heels should be slightly wider than your toes. Clasp your hands behind your back in a fist. Fold your torso forward at the hips, move your head and hands towards the ground. Nighttime Goddess Stretch: Nighttime Goddess Stretch is a relaxing pose you can even do in bed! It is performed by laying on your back either on the floor or on your bed. Move the soles of your feet together and let your knees fall outward. Lastly place both arms at a 45-degree angle on either side of your body and close your eyes. You can hold the pose for 3-5 minutes and allow your mind to relax and unwind from the day. Legs up the Wall: Legs up the Wall pose helps to relieve lower back pain and instills a sense of calmness in your body. This pose is simple to perform, just lay on the ground in front of a wall and lift your legs up against the wall. Be sure to rest your bottom against the wall to get the proper stretch for your body. These poses will help instill a calmness and rest in your brain so that you can get a better night’s sleep. I find when I do these stretches before bed, I get a great night’s sleep. I wake up way more rested and equipped to handle the daily stresses of life. My daily cup of coffee isn’t completely out of the picture but I have an extra boost in the morning when I take time at night to do some yoga! I hope that these poses help you to get a better night’s sleep!